Community based programs are often a necessity in order to help impoverished areas thrive. But connecting citizens to those resources can be a challenge. 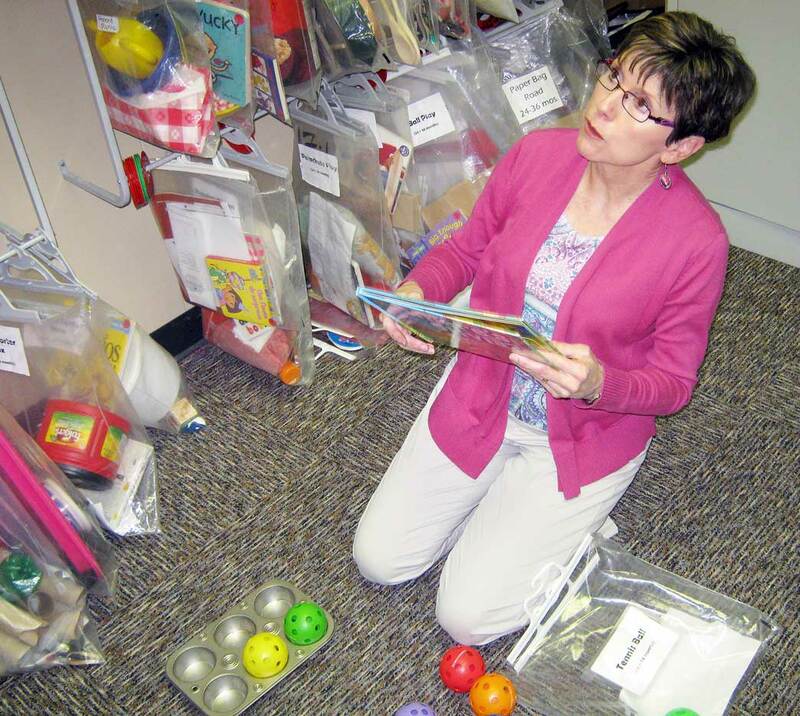 Janis Williams displaying one of the many learning accessories that Healthy Families Durham uses to help the children advance their developmental skills. Healthy Families Durham, located at 411 W. Chapel Hill St., Suite 908, is a program of the Center for Child & Family Health. It was established to help fight the odds against struggling families in the community. HFD was started in 1996 with a grant from Durham’s Partnership for Children with the goal of preventing area child abuse and to help identify children with special needs and promoting child health. In 1999, Healthy Families Durham became a program of the Center for Child and Family Health. Janis Williams is the program director at Healthy Families Durham and helped start the program. Before HFD, she worked with families from all walks of life who experienced difficulties. The mother of two children is passionate about the child prevention field and served on the original task force for HFD. “By visiting the homes in Durham, we can provide information about child development, health, and safety,” she said. The home visitation program focuses on children from birth to three years of age. HFD works to give children a good starting foundation and to prepare them for school. Looking at the numbers, the need is in great demand. According to the Durham’s Partnership for Children website, there are about 25,000 children up to age 5 living in the county. Nearly 46 percent live in low-income families. As of 2010, the most recent numbers at DPFC, although the median family income in Durham County was $62,284, nearly 20 percent of children five years or younger lived below the poverty level. Numbers like these are what Williams and the HFD staff deals with. Every day, Williams plays her managerial role by supervising the staff of nine family support workers. She works closely with them to make plans for their in-home visits and to help solve any problems that may arise during those visits. Each family support worker performs about three home visits per day across Durham. According to DPFC’s 2009 -10 annual report, 155 families participated in intensive home visiting services. Currently, the program serves approximately 130 families annually. She enjoys the developmental work with community children and families. “Seeing the parents succeed in meeting their goals and seeing them get excited about the things their children can do is one of the most exciting aspects of this job,” she said. While HFD is busy on its mission in the county, the slow economy has not made things any easier on the program. The project is supported by grants from Durham’s Partnership for Children. It can make the work of making local families healthier that much harder. “The most challenging part of the job is keeping the funding stable so that the home visitors can provide these excellent services for families,” said Williams. Although HFD receives a great amount of funding from Durham’s Partnership for Children, United Way of the Greater Triangle, Durham County Infant Early Childhood Home Visiting, and the AJ Fletcher Foundation, Williams is slightly concerned with the longevity of the program due to lack of funding. “This is especially challenging in these days of budget cuts,” she said. Even with occasional financial dismays, Williams remains cheerful and proud of the program. Her environment helps her maintain her happiness. “I enjoy meeting the families and the young children and hearing about the difference that Healthy Families Durham has made in their lives”, said Williams. Like Williams, Fusaro believes their daily work with families is making a difference. “The most important thing is that we’re supporting the parent-child bond in their own home where parents are the most comfortable,” said Fusaro. Williams said each year improvements are being made for local families to find how HFD can better serve the local community. The organization recently completed a random controlled study that found parents participating in the program were significantly less stressed and children participating improved also. In addition, approximately 95 percent of children HFD work with are up-to-date on their immunizations and connected to a medical home – an important part of raising healthy kids. HFD also makes it a point to continuously remind parents about staying abreast with their children’s immunization records. Although they cannot personally transport families, they can provide bus passes for families that lack transportation. Fusaro feels that this in-home visitation aspect of the program is what makes Healthy Families Durham most beneficial. She said it gives family support workers the opportunity to provide services that work. Healthy Families Durham said its goal is about reducing stress on parents and keeping them connected to helpful resources while working to improve child behavior. Anyone who is interested in volunteering or enrolling in the program should contact Janis Williams at 919.419.3474 ext. 310 or email at jan.williams@duke.edu. Marcus is a NCCU Staff Writer for the Durham VOICE.